Pituitary craniopharyngioma may present as growth which is cystic with calcification that derived from the remnants of the Rathke’s pouch. It consists of cords of columnar epithelium or stratified epithelium with keratin. Radiography image may produce and detect the present of calcified lesion in the brain. Patient with craniopharyngioma may complain of visual disturbance in the form of bitemporal hemianopia due to compression of the optic chiasm. Patient may also present with diabetes insipidus or growth impairment. 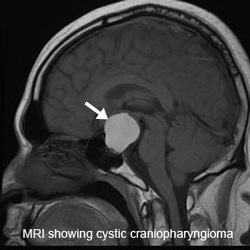 The treatment for craniopharyngioma may involve the removal of the growth.